Acetohalobium arabaticum Zhilina and Zavarzin 1990 is of special interest because of its physiology and its participation in the anaerobic C1-trophic chain in hypersaline environments. This is the first completed genome sequence of the family Halobacteroidaceae and only the second genome sequence in the order Halanaerobiales. 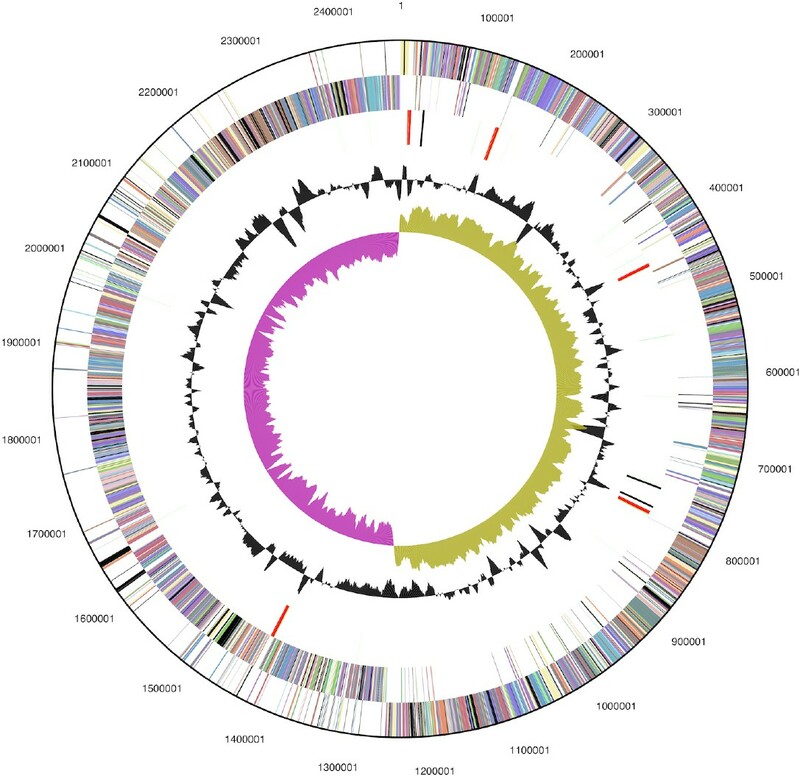 The 2,469,596 bp long genome with its 2,353 protein-coding and 90 RNA genes is a part of the Genomic Encyclopedia of Bacteria and Archaea project. Strain Z-7288T (= DSM 5501 = ATCC 49924) is the type strain of the species Acetohalobium arabaticum, which is the type species of the genus Acetohalobium [1,2]. The genus name derives from the Latin word ‘acetum’, meaning vinegar, and the Greek words ‘halos’ and ‘bios’, meaning salt and life, respectively, in order to indicate an acetate-producing organism living in salt . The species name derives from Arabat, a peninsula between the Sea of Azov and Sivash , since the strain was isolated from lagoons of the Arabat spit (East Crimea) which separates Sivash lake from the Sea of Azov . Currently, this is the only known strain in the genus Acetohalobium. 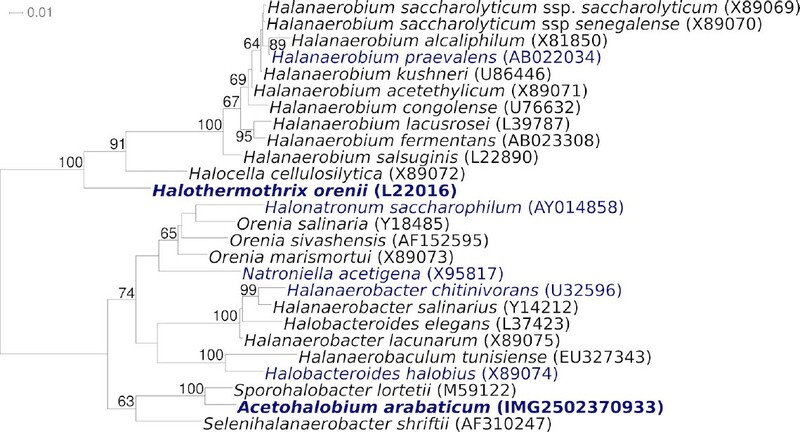 A. arabaticum participates together with other halophilic bacteria and the genera Methanohalophilus and Methanohalobium in the C1-trophic chain in hypersaline environments . Here we present a summary classification and a set of features for A. arabaticum Z-7288T, together with the description of the complete genomic sequencing and annotation. The cells of A. arabaticum are bent rods, motile by one to two subterminal flagella (Table 1) . The flagella are stated in the original description , though they are not visible in our study (Figure 1). The cells are single, in pairs or form short chains, being 0.7–1 µm in diameter and 1–5 µm in length . Other typical cell aggregates are palisades and ribbons, which are formed by adhesion of cells having intimate contact (Figure 1) . The multiplication is by binary fission. The outer membrane is typical of a Gram-negative organism . Growth is completely inhibited by 100 µM/ml streptomycin, benzylpenicillin, bacitracin, erythromycin, gentamycin, kanamycin, vancomycin or tetracyclin . Strain Z-7288T is obligately anaerobic, tolerating up to 12 mM H2S. Neither O2, S2O32-, SO42-, nor S0 can serve as electron acceptors. Strain Z-7288T requires a salt concentration of 10–25% NaCl, the optimum is 15–18% NaCl . The optimal pH is between 7.6 and 8.0 . A. arabaticum exhibits three modes of nutrition : It is chemolithoautotrophic using H2 together with CO2 or CO; it is methylotrophic using trimethylamine (TMA); and it is organotrophic using betaine, lactate, pyruvate or histidine. Carbohydrates are not utilized. No growth occurs on methanol, monomethylamine (MMA), dimethylamine (DMA), dimethylglycine, choline or sarcosine . When grown on TMA, an equimolar amount of acetate is formed along with lesser amounts of DMA and MMA . Betaine is degraded mainly to acetate and minor amounts of methylamines . Carbonic anhydrase (CA; carbonate hydrolyase, EC 4.2.1.1) has been studied in strain Z-7288T and in other acetogenic bacteria . This zinc-containing enzyme is found in animals, plants, bacteria and archaea and catalyzes the following reaction: CO2 + H2O ↔ HCO3- and H+ . Further biochemical details of CA are described elsewhere . Strain Z-7288T displayed CA activities similar to those of other CA-containing bacteria [16–18]. With lactate as cultivation substrate the specific activity of CA in strain Z-7288T has been determined to be 2.1± 0.4 units per mg or protein . It has been suggested that one physiological function for CA in acetogens is to increase intracellular CO2 levels . The 16S rRNA genes of the other type strains in the family Halobacteroidaceae share between 85.9% (Orenia sivashensis ) and 95.1% (Sporohalobacter lortetii ) sequence identity with strain Z-7288T . Uncultured clone sequences from environmental samples and metagenomic surveys do not surpass 84–86% sequence similarity to the 16S rRNA gene sequence of strain Z-7288T, indicating a lack of further members of the genus Acetohalobium in the habitats screened thus far (status June 2010). Figure 2 shows the phylogenetic neighborhood of A. arabaticum Z-7288T in a 16S rRNA based tree. The sequences of the five 16S rRNA gene copies in the genome of Acetohalobium arabaticum Z-7288T differ from each other by up to one nucleotide, and differ by up to three nucleotides from the previously published 16S rRNA sequence generated from DSM 5501 (X89077). Phylogenetic tree highlighting the position of A. arabaticum Z-7288T relative to the type strains of the other genera within the order Halanaerobiales. The trees were inferred from 1,308 aligned characters [22,23] of the 16S rRNA gene sequence under the maximum likelihood criterion  and rooted in accordance with the current taxonomy . The branches are scaled in terms of the expected number of substitutions per site. Numbers above branches are support values from 300 bootstrap replicates  if larger than 60%. Lineages with type strain genome sequencing projects registered in GOLD  are shown in blue, published genomes  in bold. No chemotaxonomic data are currently available for the genus Acetohalobium. A. arabaticum Z-7288T, DSM 5501, was grown anaerobically in DSMZ medium 494 (Acetohalobium medium)  at 37°C. DNA was isolated from 0.5–1 g of cell paste using MasterPure Gram Positive DNA Purification Kit (Epicentre MGP04100). Two µl lysozyme and five µl mutanolysin were added to the standard lysis solution for 40min at 37°C followed by 1 hour incubation on ice after the MPC-step. The genome of A. arabaticum Z-7288T was sequenced at using a combination of Illumina and 454 technologies. An Illumina GAii shotgun library with reads of 483 Mb a 454 Titanium draft library with average read length of 341 bases, and a paired end 454 library with average insert size of 10 kb were generated for this genome. All general aspects of library construction and sequencing can be found at http://www.jgi.doe.gov/. Illumina sequencing data was assembled with VELVET and the consensus sequences were shredded into 1.5 kb overlapped fake reads and assembled together with the 454 data. Draft assemblies were based on 241 Mb 454 draft data, and 454 paired end data. Newbler parameters are -consed -a 50 -l 350 -g -m -ml 20. The initial assembly contained 72 contigs in one scaffold. The initial 454 assembly was converted into a phrap assembly by making fake reads from the consensus, collecting the read pairs in the 454 paired end library. The Phred/Phrap/Consed software package was used for sequence assembly and quality assessment in the following finishing process . After the shotgun stage, reads were assembled with parallel phrap (High Performance Software, LLC). Possible mis-assemblies were corrected with gapResolution (http://www.jgi.doe.gov/), Dupfinisher , or sequencing cloned bridging PCR fragments with subcloning or transposon bombing (Epicentre Biotechnologies, Madison, WI). Gaps between contigs were closed by editing in Consed, by PCR and by Bubble PCR primer walks (J.-F. Cheng, unpublished). A total of 292 additional reactions were necessary to close gaps and to raise the quality of the finished sequence. Illumina reads were used to improve the final consensus quality using an in-house developed tool (the Polisher ,). The completed genome sequences have an error rate of less than 1 in 100,000 bp. Genes were identified using Prodigal  as part of the Oak Ridge National Laboratory genome annotation pipeline, followed by a round of manual curation using the JGI GenePRIMPpipeline . The predicted CDSs were translated and used to search the National Center for Biotechnology Information (NCBI) nonredundant database, UniProt, TIGRFam, Pfam, PRIAM, KEGG, COG, and InterPro databases. Additional gene prediction analysis and functional annotation was performed within the Integrated Microbial Genomes-Expert Review (IMG-ER) platform . The genome consists of a 2,469,596 bp long chromosome with a 36.6% GC content (Table 3 and Figure 3). Of the 2,443 genes predicted, 2,353 were protein-coding genes, and 90 RNAs; Seventy-one pseudogenes were also identified. The majority of the protein-coding genes (76.4%) were assigned a putative function while the remaining ones were annotated as hypothetical proteins. The distribution of genes into COGs functional categories is presented in Table 4. We would like to gratefully acknowledge the help of Maren Schröder (DSMZ) for growing cultures of A. arabaticum. This work was performed under the auspices of the US Department of Energy Office of Science, Biological and Environmental Research Program, and by the University of California, Lawrence Berkeley National Laboratory under contract No. DE-AC02-05CH11231, Lawrence Livermore National Laboratory under Contract No. DE-AC52-07NA27344, and Los Alamos National Laboratory under contract No. DE-AC02-06NA25396, UT-Battelle and Oak Ridge National Laboratory under contract DE-AC05-00OR22725, as well as German Research Foundation (DFG) INST 599/1-2 and SI 1352/1-2.